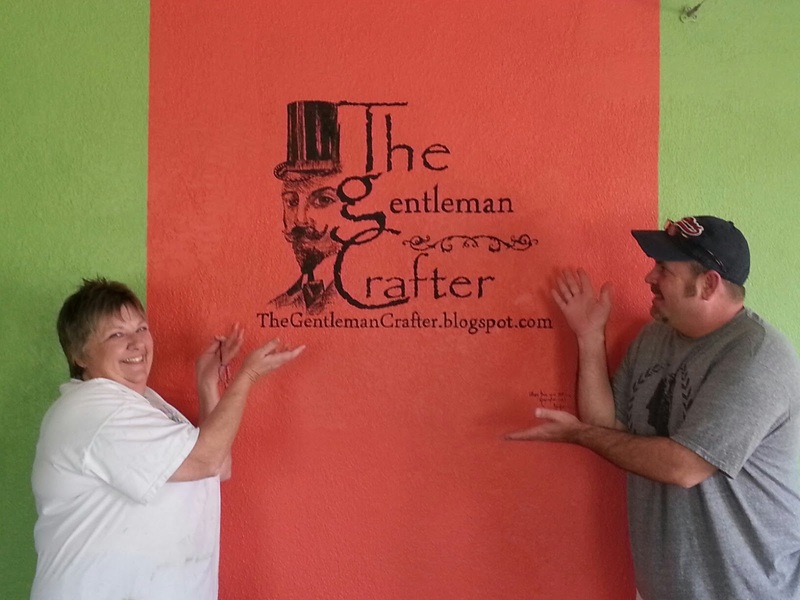 The Gentleman Crafter: It's About Time For A Post Huh? The Doc says the cast can come off on the 25th of September! That's like 24 more days! Yahooo! I've never been one to X out days on the calendar, but I certainly have been thinking about it lately. To me X'ing out a day is like NOT living the whole day to it's fullest, but just trying to move on and get through life. I've never been like that. However, I am very excited to see the 25th come and try to fill my days full of things to do until I get there. This week, the demo started and finished on the floors. Basically, all the floors have been pulled up, sacked and taken out. Next, the men came and scraped the many adhesives from the floor and finally yesterday the gent came and took out all the fans and dehumidifiers from the house. For this I am eternally grateful. The whirl and buzz of the fans although sometimes soothing were terribly loud and communication needed to be done either outside or in a bathroom. LOL! So I am thankful. Seems like progress somehow. Friday, we went by to order the floors. Surprisingly enough, with thousands of samples, the decision was made in a matter of 15 minutes. When you know what's right, you feel it. So I'm really excited. They will be ordered this coming Tuesday and hopefully the work will start this weekend. Yahooo. I can't wait to see them installed...Going to be really pretty. 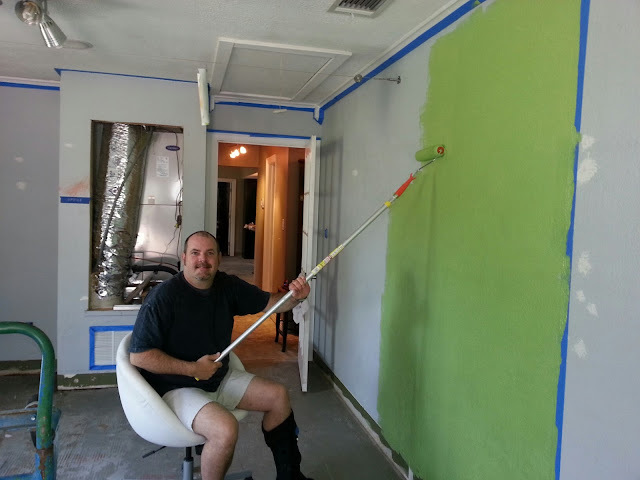 Then came the studio....It needed a little color before the floors were installed. 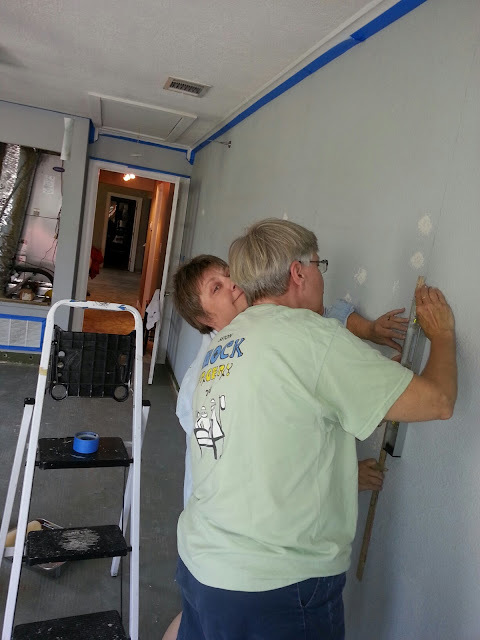 I somehow sweet talked Cesar, Barb and Kay to join in Peg Leg Jimbo to get this job done. We started yesterday morning. I rolled around in my old IKEA office chair which was the perfect height to undo the electrical plates and wall switches. 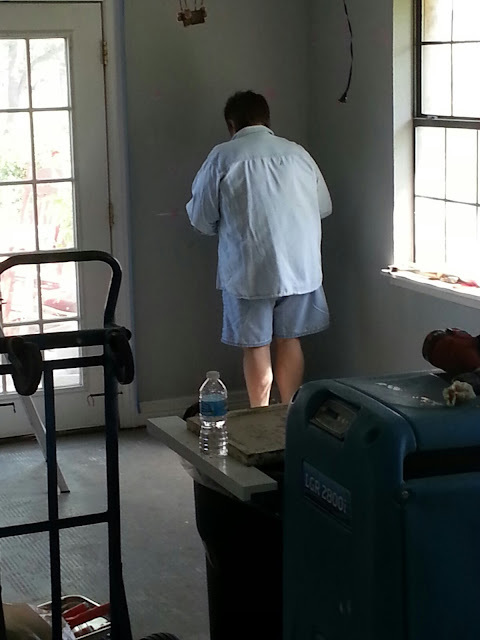 Cesar took off the baseboards as they were going to have to come off anyway for the floors. 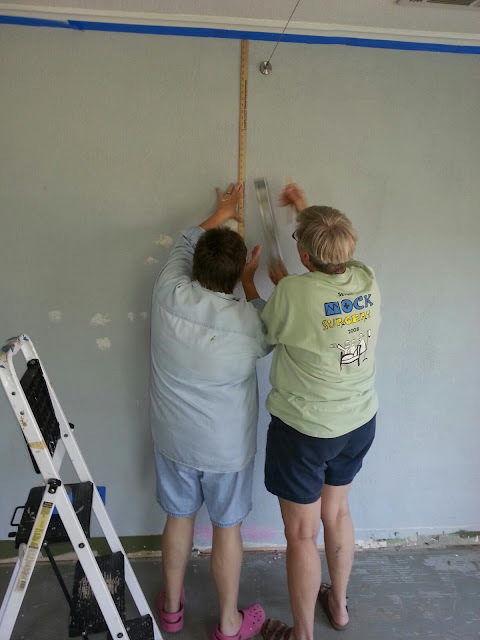 Barb and Kay painted and worked so hard! I kept them in music from my laptop...Mama's and The Papa's...Kay chirped and danced along...Barb belted out a few as well...Cesar still popping the boards up. Kay was assigned the top of the walls and I the bottoms. At some point we got into a rhythm. 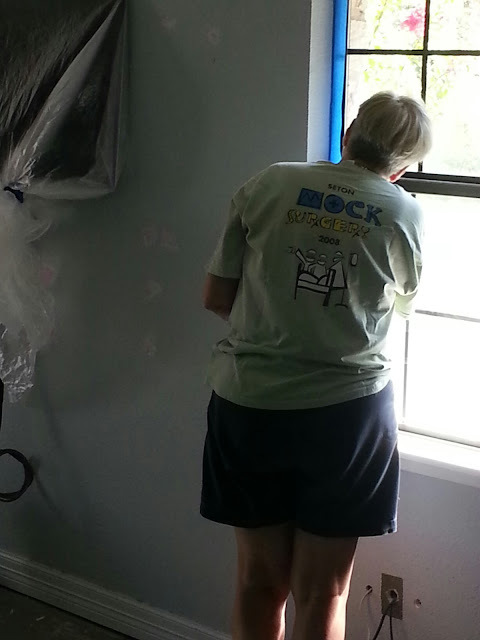 Barb worked on the darker wall and knocked it out of the water. She's amazing! Finally, my totally favorite job, I had to allow Cesar and Barb to do...Cutting in! They did an awesome job. Thanks Barb, Kay and Cesar for all you did! You Rock! I had mentioned and idea to Kay yesterday, that this morning, she made a reality for me....She painted my logo on the wall! Like PAINTED!! Painted Painted! I am always amazed at this woman's talent! Thank You Kay!!! I think by having this cast on my leg, it has made me take things slower and enjoy my friends more. I'm always zooming around trying to do a million things. Though some of that has not stopped, it certainly has slowed me down. I've read books...when was the last time I had time? I am hooked on Dan Brown's Inferno at the moment. Stopping occasionally to work on secret projects and going back to my book...Back and forth all day...Just enjoying the weekend. I sit at a desk in front of a window in my make-shift "bedroom studio" and look up to rest my eyes. So cool to see all the birds that come to the feeder directly in front of me. It's amazingly peaceful to see them pluck and plunder the bird seed, to watch the way the hot breeze moves the branches of the oaks and to delight over the butterflies sucking up the nectar of the Blue Shade. Then my brain does what it does best...It focuses in on the window screen blurring the outside beauty and I begin to count how many squares per inch is in the screening material. From there I think...wonder what would happen if you used screening material in crafts this way and that way....see...relaxation comes and goes...Better get back to my book before I rip the screens off for a new project! Just wanted to give y'all an update and put something new on my blog! Good Gravy! O My! 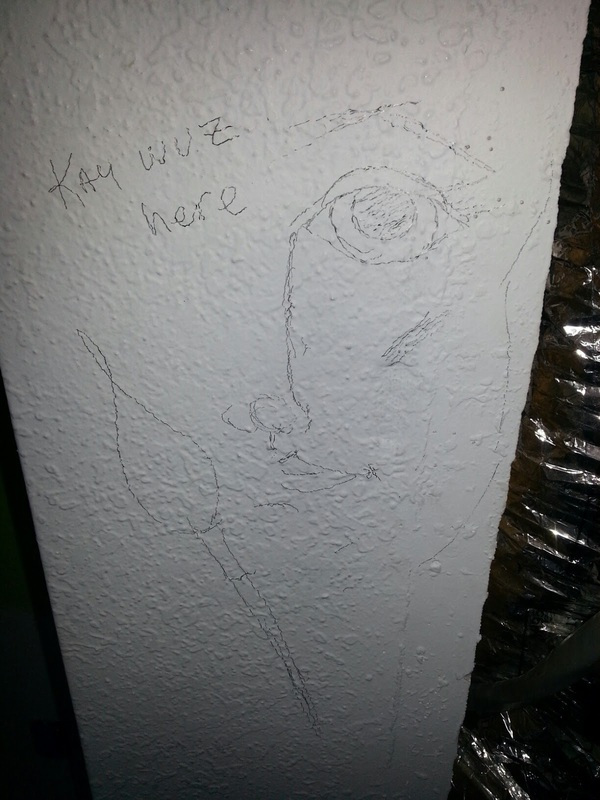 You'd better treasure Kay and never paint over that section of wall! Love the colors - bright and happy. Wonderful description of the yard Jim. It made me feel peaceful. I am trying to work on projects this weekend, but have been getting no where. Mojo is missing. So spent time in the pool with a trashy novel and enjoyed watching the wasps and dragonflies come in for a drink of water. Off to my room tonight to work on ???? The logo is awesome. Don't cover it up with shelves! LOL Can't wait to see the floors. Wish you had come to see mine before picking yours, but it will be awesome. Best part, you don't have to lay them!! That is amazing. What a beautiful thing for Kay to do for you! 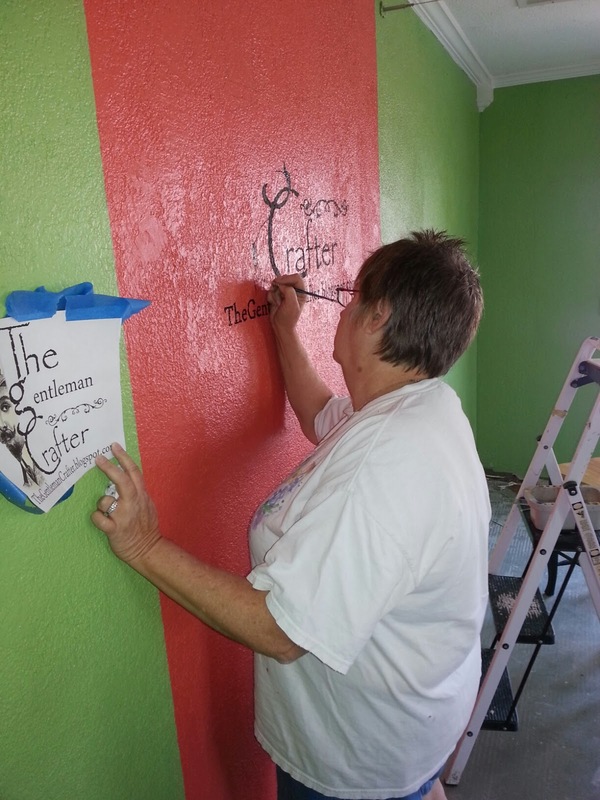 Everyone is so awesome to help you get the studio painted and big kudos to Kay for painting your logo....what a talented lady!!!!!!! It those colors and the logo don't spark creativity in that room, nothing will! The studio looks AMAZING, love the colors and the logo is FABULOUS!!!! Kay did a great job on it. I'm glad to hear you are healing and soon to have the cast off. Enjoy the rest of your weekend. Oh! I love those colors! And I love that panel with your logo!!! Did Kay freehand that? It looks amazing! Thanks for sharing the project progress! OK you peaked into my studio did you. My accent wall is basically the same color. 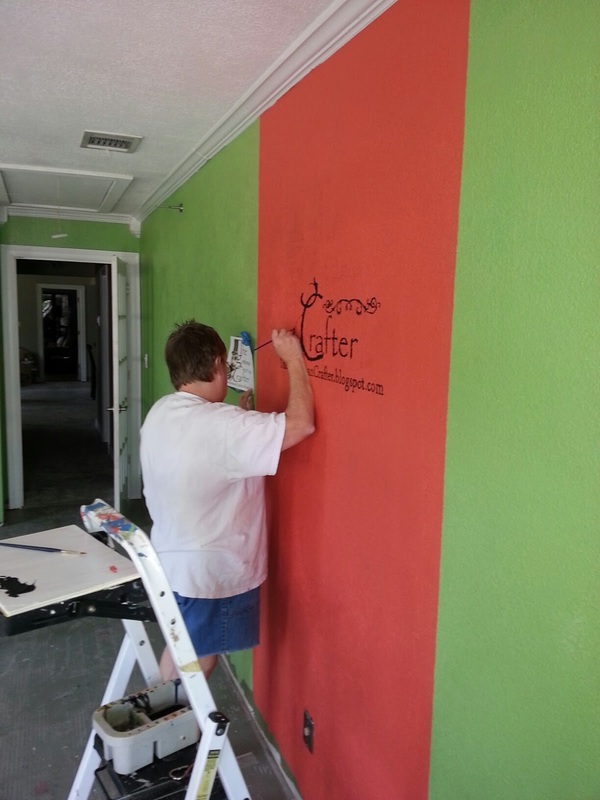 The paint company here calls it Copper Canyon, but in your picture it looks the same color and it is my favorite color. The other walls are green. DH calls my studio the peas and carrots room. Oh well I am happy in it. I LOVE the logo that Kay painted for you!!! It's beautiful!! The Lord works in mysterious ways....he slowed you down to raise you up! eh? #1 THE WALL - A-MA-ZING!!! Oh, my God, is that the coolest wall, or what? She is sooooooooooooooooooooooooo talented! #2. Your color choice is Rockin'. If THAT doesn't wake up your Creative Spirit, nothing will. BRAVO. #3. There is Nothing More Fun than having Friends who LOVE ART! Yep! We ARE blessed. Glad things are going good for you (except the cast, but that won't be there long). You have some very special and talented friends, count yourself blessed. With all the pictures though....poor Cesar is STILL in the corner!! I'd buy a nice big wood frame for the gorgeous logo she painted! Glad you are getting fixed - both the house and the leg! Love the studio and your sign looks just great! Wow! Now those are friends to treasure indeed...your logo looks fabulous on your newly painted wall - Kay's work is amazing. So good to hear that you are taking time to enjoy your friends instead of racing around. It won't be long now for the leg cast and the house.. take care! Wow... What talent!!! You studio is looking fabulous and Kay... you are amazing!!! Glad you are able to stop and enjoy for a few minutes before your OCD tendencies pop into play!!! Hugs and Hope you have a wonderful week!!! Kay, that is AMAZING!!!!! It would've been brilliant on a flat surface, but doing it on a rough surface is really AMAZING!!!!! I like Bobbye B's idea of the big wooden frame for it. Jim, you have some truly wonderful friends. Well done, Cesar, Kay and Barb! That's Wonderful! (I need to borrow your friend Kay and you for a week! )Truely wonderful! enjoy your new space! 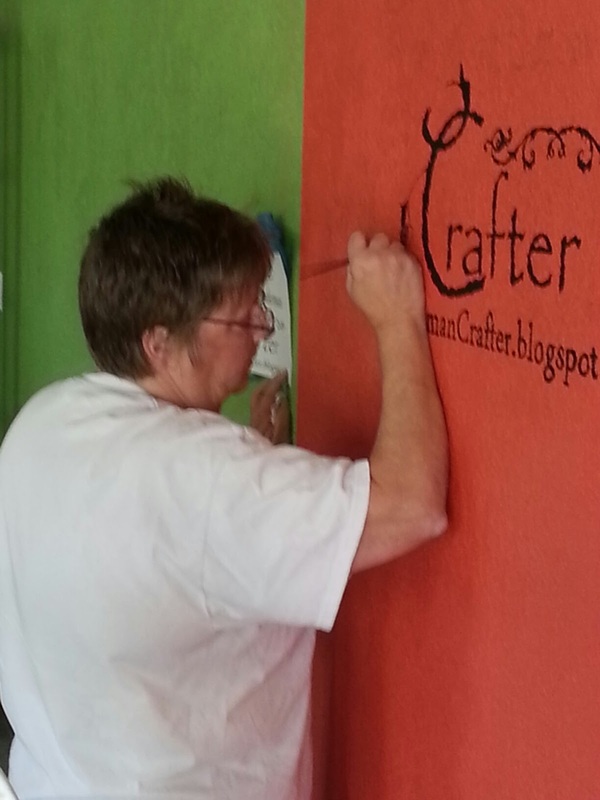 Kay did a beautiful job on your logo - and what a neat thing to have on your wall! Sometimes dissacters are hidden pleasures. Just think Jim, you would not have had your studio redecorated, and expecially with such talented touches by special friends. I know the timing sucked, but it seems to be all working out and just think, you will have the house all freshened up and like knew. And, it was mostly covered by insurance to boot!!!!! So one could look upon this all as your glass half empty, or in your case - half full. It is going to look wonderful when it is all done. Thank goodness for wonderful friends!!!!!! Your logo looks wonderful - well done to Kay. I'm so glad things are moving in the right direction for you, both with your leg & with the house. Onwards & upwards! Wow, your logo is fabulous! Yea, for Kay! Glad your getting some me time. Enjoy the weekend! I just saw that you can buy tape that looks like instant ornate gold frame (Tim's new die) and create a frame on the wall. It's at Cooper-Hewitt National Design Museum - $15.Just popped into my head when I saw Kay's remarkable painting. Isn't it a wonderful feeling to have 3 such awesome friends. 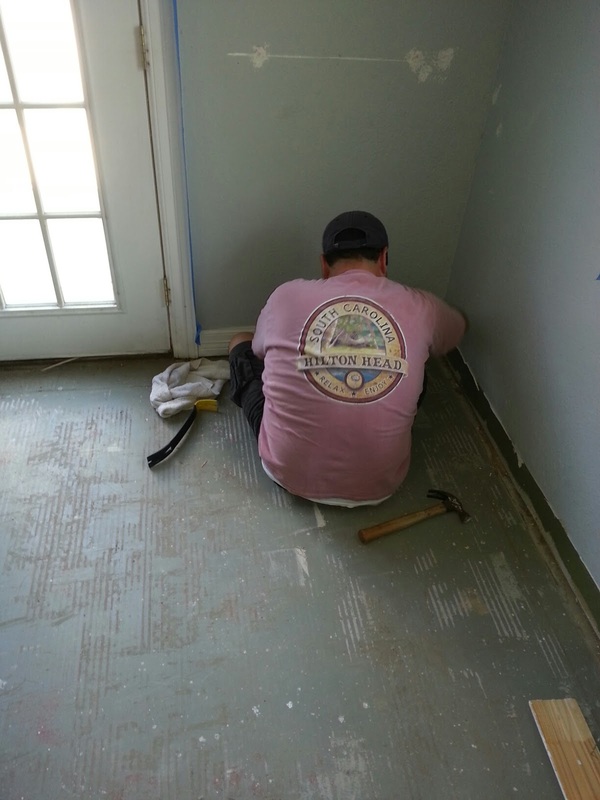 Can't wait to see your floors. Pretty cool - everything is getting back to normal for you. Lucky you Jim! That is wonderful. 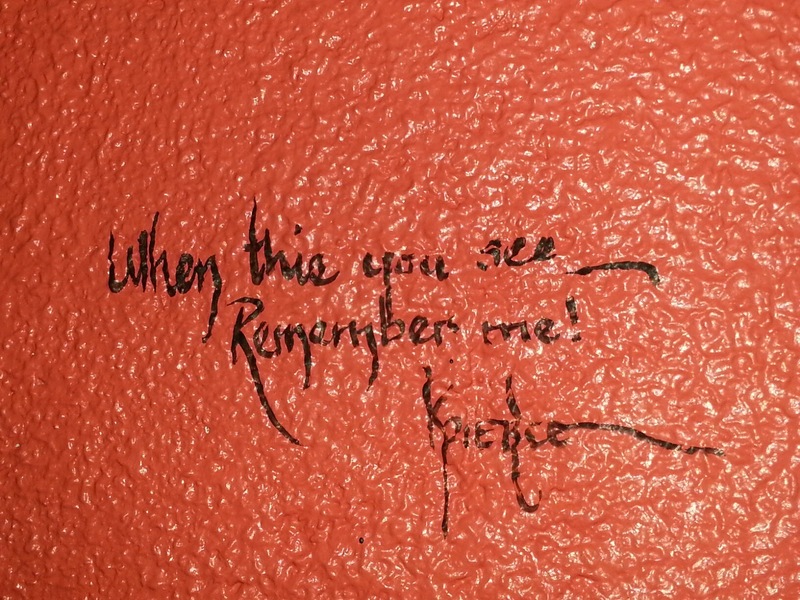 You'll love looking at that everyday and always think of Kay. OMG! That green looks like the green I painted my craft room. I love how the brightness livens up the place! Your friend Kay is a phenomenal painter! Can't wait to see what your space looks like when you're all set up! OMG Kay - that looks awesome! Great job! It's nice to get a makeover every once in a while, but to bad it comes with some disaster in most cases. Love, love, love the feature wall. Uh-mazing!